Is Disney Desperately Repurposing Old Tangled Merch as Frozen? It's been months now, but Disney is still struggling to keep shelves stocked with toys and costumes from its mega-hit Frozen—all of which sell out within hours, much to the chagrin of frustrated parents everywhere. But has the insane demand for Elsa merch prompted Disney to repackage accessories from its other franchises in a desperate attempt to capitalize on Frozen-mania? 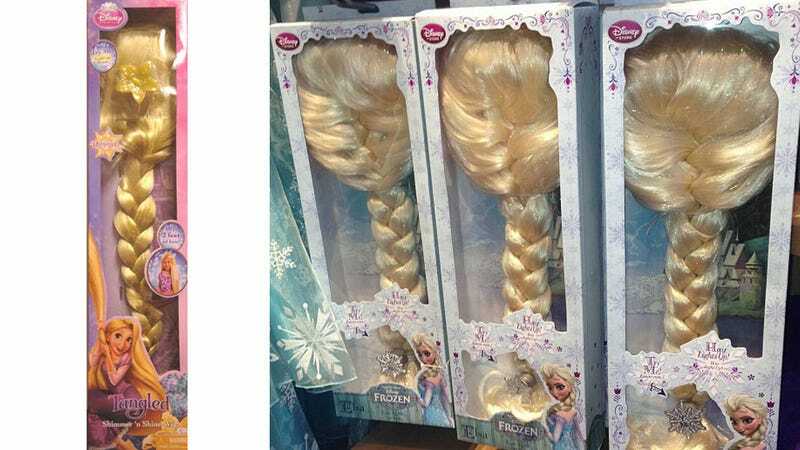 As recently as two weeks ago, the Disney Store was selling a light-up Elsa wig, featuring the character's signature blond braid. For anyone who has seen the film, it seemed odd that the Elsa wig would light up or have iridescent tinsel strands. Her platinum blond hair doesn't light up in the movie, nor is there anything really magical or crystal-y about it other than a thick, long braid. This was not lost on at least one pissed-off Amazon reviewer who pointed out that this was actually a feature of Rapunzel's hair from Disney's 2010 animated feature Tangled. I love Disney, I love Frozen and I think that any toy that they want to come out with is great as long as it respects the characters. Last time I checked it was Rapunzel, not Elsa who had hair that glowed. The braided with they sell with a ribbon is fine, but not this glowing one, because Elsa simply does not have hair that glows. Why would Disney allow this? It is disrespectful to the people who put Tangled together, and Tangled launched a new era for Disney. THIS REVIEW HAS NOTHING TO DO WITH THE PRICE. If the item is hard to find then up the price I get it. Disney, you wouldn't make a frog with a crown and call it Elsa's Frog Prince or a carpet called Elsa's Flying Carpet right? Because Elsa is not Tiana with a frog prince, she is not Jasmine with a magic flying carpet and SHE IS NOT RAPUNZEL with magic glowing hair. The Disney Store no longer sells the Tangled Shimmer 'n Shine Wig, but a description of it is very similar to the Elsa light-up wig. Both weight about 1.2 pounds and both are powered by 3 AG13 batteries, which are included with the wig. Rapunzel's wig lights up when her flower clip is pressed, whereas Elsa's wig lights up when her snowflake clip is pressed. But even if the Rapunzel wig was repackaged as an Elsa wig, it doesn't really matter anymore. Originally retailing for about $30 at the Disney Store, the wig is completely sold out. However, it can be purchased at a mark-up on Amazon or eBay for around $55 to $90.